How We Became An Award Winning Contractor. By now you’ve probably seen it all: You’ve probably run across salespeople who are pushy, and will try to sell you something—anything, whether you need it or not. You’ve run into salespeople who will give you a discount, but “only if you buy today; right now” (though if you insist that you need a little extra time, they’ll say something like “my boss is going to kill me, but I like you and I’ll stretch the discount another couple of days just for you.”) You’re no longer shocked by this, although you’re not sure what’s uglier; their dishonesty or their polyester suit. The expression “Buyer Beware” exists for a reason. Some companies have armies of salespeople whose sole purpose is to sell; not sell what you need, not sell when you need to buy, not build a relationship with you, the customer, but just sell—period. In the end you end up being unhappy, feeling jaded, often cheated, and the salesperson makes their own life more difficult because that’s certainly no way to obtain repeat business. So is there really a way to avoid this awful experience? 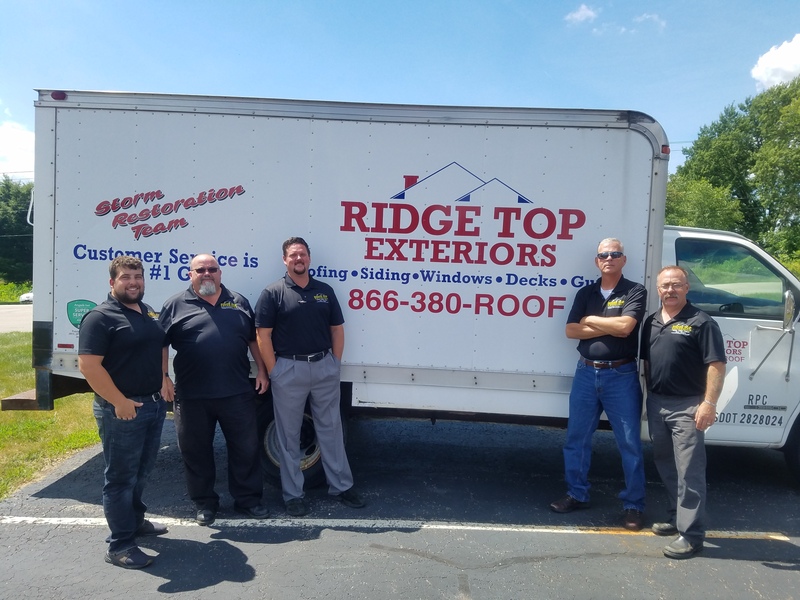 Ridge Top Exteriors has years of experience with roofing, windows, siding, gutters, and more; it has glowing Google reviews, has won Angie’s List Super Service and other awards for several years in a row, and has the highest possible rating with the Better Business Bureau. It has millions of dollars in Sales, but has no salespeople on staff. Not one. How is that possible? Salespeople do nothing but sell; they go from house to house peddling stuff, sell as much as they can, as fast as they can, and move on to the next customer. Ridge Top didn’t become an award-winning company by treating people that way. A Few Project Managers From Ridge Top Team. The friendly experts at Ridge Top are not salespeople; they’re Project Managers who are true industry experts—trained and certified by the most reputable manufacturers, to ensure they are truly knowledgeable about the company’s products and can answer homeowners’ questions. Just as importantly, they don’t just do “drive-by” sales; once a homeowner chooses the roof, windows, siding or gutters that are right for them from Ridge Top’s impressive array of options, that same Project Manager that the homeowner met on day one will stay involved throughout the project, making sure the installation is scheduled conveniently, the crew has everything they need, and the finished job is done to perfection—and to your complete satisfaction. So maybe when it comes time to do a major home improvement project that will use the finest materials and expert installers, increase the value of your home, and save you money in the process, you should call a company that doesn’t have salespeople at all. A friendly expert from Ridge Top Exteriors will conduct a free home inspection, give you a free, no obligation estimate, and answer all your questions. If you decide Ridge Top is your top choice, that same Project Manager will stay on your project from the very first day to its completion. At long last, you’re just one phone call away from a refreshing change: Goodbye pushy salespeople; hello Ridge Top Exteriors!